In developing its submarines, the United States has tended to pursue technical, rather than numerical, superiority. Such was the case during the Cold War, when the United States led in nuclear submarine development while the Soviets marshaled a much larger submarine fleet. After the Cold War concluded, Washington was faced with the possible threat of non-nuclear submarine deployment by third world nations. During the Cold War, there were two principal types of U.S. submarines, the fast attack submarine (SSN) and the nuclear-powered ballistic missile submarine (SSBN), nicknamed the "boomer." Both were nuclear-powered. Fast attack submarines were tasked toward locating and tracking their Soviet counterparts, for which they carried extensive intelligence-gathering equipment. Their principal weapon was the torpedo, although at times they were armed with tactical missiles such as the cruise missile. The U.S. Navy's first nuclear sub was the Nautilus, commissioned on September 30, 1954. It was followed during the 1950s by almost two dozen other craft, including several in the Skate, Shipjack, and Triton classes. The USS Louisiana , an Ohio-class nuclear powered submarine with an armament including 24 Trident II missiles, arrivies at its home port in King's Bay, Georgia. built during a period from the mid-1970s to the mid-1990s, and many are still in use. "Boomers" and beyond. During the period from 1960 to 1966, the Navy introduced a total of 41 SSBNs, or "boomers." This group was nicknamed "41 for Freedom," because each was named after a hero from American history, as reflected in the names of the three classes: George Washington, Ethan Allen, and Benjamin Franklin. (The first two groups consisted of five submarines each, with 31 in the third group.) Each of these carried 16 Polaris nuclear missiles, but in 1972, conversion to the more accurate Poseidon missile began. By 1979, the even more advanced Trident I missile had been introduced, and the last 12 of the original 41 SSBNs were converted for this missile. The next generation of SSBN arrived with the Ohio, which inaugurated a much larger class of sub in 1981. Ohio class subs are 560 feet (170.7 m) long and 42 feet(12.8 m) abeam. The first 12 were equipped to carry 24 Trident I missiles, and with the introduction of the Trident II in 1990, subsequent models were built for this newer, larger missile. The 18 SSBNs of the Ohio class together carry 50% of all U.S. strategic warheads. Four of the Ohio class were scheduled for inactivation in 2003 and 2004, but instead they are being converted to guided missile submarines (SSGN). The primary mission of the latter will be support for land attack and special operations forces, a change that reflects that differences between the Cold War battlefield and more modern asymmetric warfare. SSGNs will be equipped with as many as 154 Tomahawk missiles. In submarines as in much else, the Soviets lagged behind their Western foes, and what they lacked in sophistication and accuracy they attempted to make up for in numbers. Their first subs were based on German models observed during World War II. 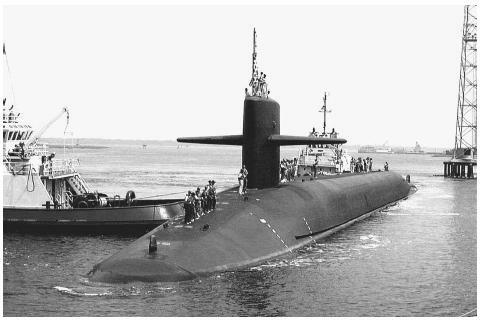 By the late 1950s, they had deployed their first diesel and electric ballistic missile submarines, and in 1960 launched their first nuclear-powered subs. The Soviets, with their more limited budgets, were actually decades ahead of the Americans in one area: the SSGN, which they first began operating in the 1960s. By 1980, the Soviet Union had 480 submarines, of which 71 were fast-attack craft and 94 SSBNs or SSGNs. Among these was the Alfa class, built in the 1970s, which had 30-man crews and could achieve speeds of 43 knots (80 kph) and depths of 2,000 feet (600 m). The Typhoon class, first deployed in 1977, was the largest class of submarines ever built, at a length of 563 feet (172 m) and a beam of 81 feet (25 m). The Soviets, unlike the Americans, continued to build diesel-electric subs. Among these were the Kilo class, which first entered service in 1979 and are still being built for export. From the early 1990s, it became apparent that the United States faced new challenges in the form of third-world nations armed with nuclear subs. Among these was Iran, which in 1993 deployed its first Kilo class subs in the Persian Gulf. Thus armed, the Teheran regime could close the Strait of Hormuz, through which one-quarter of the world's oil passes. Of the third-world countries that together possessed a total of 150 submarines, the largest share belonged to North Korea, with 25. Libya had six, as did Pakistan, whereas Pakistan's longtime foe India had 18. Among the factors driving the sales to third-world countries was the collapse of the former Soviet Union, which had left Russia economically distressed and in need of hard currency. Given the fact that defense technology was one of the few areas in which the Soviet state had excelled, sales of submarines seemed a logical choice. Other, more prosperous Western European countries were also selling submarines to third-world countries, with Germany and France in the lead. At the same time, segments of the U.S. defense industry, facing downturns in production following the end of the Cold War, had begun to pressure Washington for an opportunity to gain a share of the emerging new markets in countries such as Egypt, Taiwan, and Argentina. Ahrens, Frank. "Submarines, Examined at Depth: The Smithsonian's New Nautical Exhibit Settles in for a Three-Year Tour." Washington Post. (May 8, 2000): C1. Arney, Kevin. "Midshipman Cruises Aboard Fast Attack Submarine." The Officer 73, no. 11 (November 1997): 57. Lehman, John. "Silent, Deep, Deadly." Wall Street Journal. (November 11, 1998): 1. Revelle, Daniel J., and Lora Lumpe. "Third World Submarines." Scientific American. (August 1994): 16–21. Navy Fact File: Attack Submarines. U.S. Navy Office of Information. < http://www.chinfo.navy.mil/navpalib/factfile/ships/ship-ssn.html > (April 7, 2003). Submarine Weapons. Smithsonian National Museum of American History. < http://americanhistory.si.edu/subs/weapons/index.html > (April 7, 2003).